Last November the results of an election in Kentucky would take a while to reach all corners of the globe, but when it did, it made the news everywhere. Unlike other election outcomes though, this election would bring a smile to the face of all who read. Meet Brynneth Pawltro, a four year old rescue Pit Bull and Lady Stone, a nine year old Border Collie. 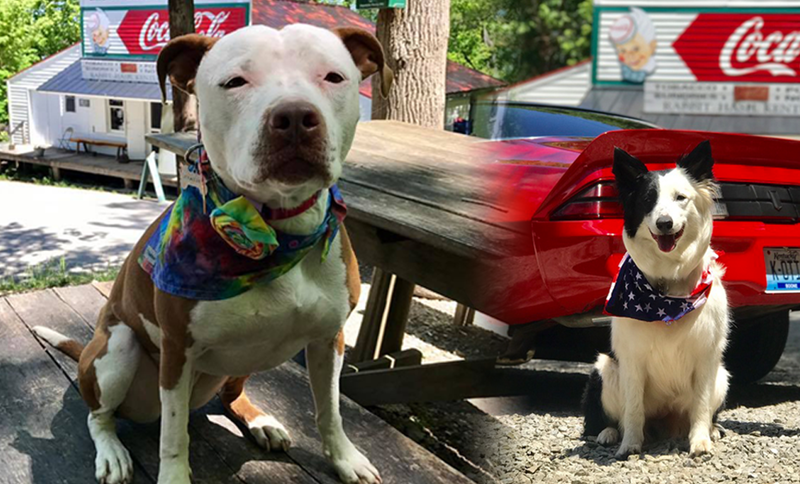 Together they make up a team of three canine political figures in the town of Rabbit Hash elected for the people and by the people, who each donated $1 per vote in a fundraising drive for the town. In the words of Mayor Brynn’s mum "In this election the people had a choice! The town really went to the dogs." To find out more about the history of Rabbit Hash and the legacy these two dogs hope to leave, we spoke with Jordie Bamforth and Rob Stone, owners of Mayor Brynn and Lady Stone, respectively. Hi Jordie and Rob, thanks so much for making the time to speak with us today and belated congratulations on your election wins! Lady’s one of two of the town’s first ambassadors isn’t she? Why did you decide to put both girls forward for the election battle? And her being a Pitbull, and such a sweetheart, can’t help but raise awareness and educate about Pitbulls. Was that also in the back of your mind? What would you like the legacies of Mayor Brynn and Lady Stone to be? Although the election took place last year, it’s only recently that your stories went global. How do you feel about Lady & Brynn’s stories going viral? One final question we always ask our celebrity interviewees, if you could ask your dog one question and one question only what would you ask and what do you think they’d say? Jordie, we know Mayor Brynn isn’t the town’s first mayor. Can you tell us a little about the history of your town and when the first dog was elected to office? Jordie: Rabbit Hash sits on the bank of the Ohio River in Northern Kentucky, across from Rising Sun Indiana. The first dog mayor was elected in the late 1990s. The town of Rabbit Hash is best known for the General Store, which has been operating since 1831. The town is maintained by a group of people called the Rabbit Hash Historical Society. They are a non-profit that take in donations of all types to make sure that Rabbit Hash stays as close to historically correct as possible. Rob: Many of our historical buildings are from the 1800’s and despite floods and fire, are still here for visitors. It’s a beautiful river town that has so much history packed into its small border. It’s truly an amazing place. Rob: She is. Lady holds the position alongside another dog called Bourbon, both are the first of their kind. No dog can be at every event all the time, they are dogs after all and have the important job of being a loyal family member, so the ambassadors positions were created so there is a dog presence, even in the event of the Mayor being unable to attend. None of the runner ups knew these positions would be made and they were announced on election day after Brynn had won the mayoral race. Jordie: I ran Brynn in the election to simply raise money for a place that is special to us both. Jordie: Before I adopted Brynn in 2013 from a rescue group in south eastern Ohio, I lived with a dog who was a Pitbull also and he was the absolute sweetest! Unfortunately, just about everywhere we went people were always worried he would be aggressive or turn on us. Never did he do such a thing. There was just a lot of bad press revolving around the Pitbull type dogs, and I wanted to do what I could to change some minds in the community and beyond. So, I adopted Brynn with our mission (besides being my best friend) to be an advocate for Pitbull type dogs and show people that they can do great things. Rob: I would love for our town to be more well known by dog lovers because of our dogs. I would love for everyone to bring their pups here and enjoy this place. It’s well known by motorcycle enthusiasts because of the back roads that lead here and I would love to acquire the same following but with dog lovers. This is technically private property so it’s a place where your dog can run around off leash (if they are into that sort of thing). Jordie: I would hope that her legacy is that her campaign and personality were built on peace love and understanding. Rob: Our whole town is run by a non-profit and Lady, Brynn and Bourbon are always involved in fundraising events doing what we can to help raise funds for our town. But I have to say the coolest part is knowing my dog’s memory will live forever. I went to the Boone County KY library to research Rabbit Hash history and read so much about the past mayors - Goofy, Junior (RIP) and Lucy. There were plenty of pictures of these dogs and it struck me that one day my dog would be on these shelves. Lady’s memory will live on when she is gone and I plan to leave behind the coolest pictures of her. She will live forever in the story of Rabbit Hash and while she’s in office we get to be involved in fundraising campaigns for our town and other dog charities. Rob: Yes, we’ve had dog charities reaching out and wanting to use Lady to help promote dog related non-profits, which is really cool. Some people have asked if I make money with this but the opposite is true. We donate a lot and work hard to promote and attend every dog event we can. Just having these organisations reach out to me feels so great and we intend to keep only helping all of the furry friends we can on top of raising money for our Rabbit Hash historical society. Jordie: It was pretty over whelming to be quite honest. From what I can gather, the historical society is glad to see Brynn, Lady and Bourbon raising awareness and doing some good for a town that we all cherish. Rob: It's very fun to google my dog's name and see hundreds of stories. When the election first happened in November I believe the media outlets were just too busy and the Presidential election trumped the Rabbit Hash election (pun intended) but now it’s time for a feel good story such as this and I believe that having Brynn and her dognitaries will bring a smile to most when it comes through their news feed. Jordie: I would ask Brynn what her fascination with tennis balls are. She loves those things but destroys them in minutes. Ever since she has been a puppy, guarding and destroying her tennis balls has been something she is very passionate about. So, I've just always wondered what's so great about them. She would probably just freak out and yell "TENNIS BALL, WHERE?!" At me, and that would be all the reply I would need. Rob: I would ask Lady if she knows how much I love her and I would hope she says yes. Thank you both! We wish you lots of luck for a controversy free time in office! How Close Are We to Ending Puppy Farming in the UK?